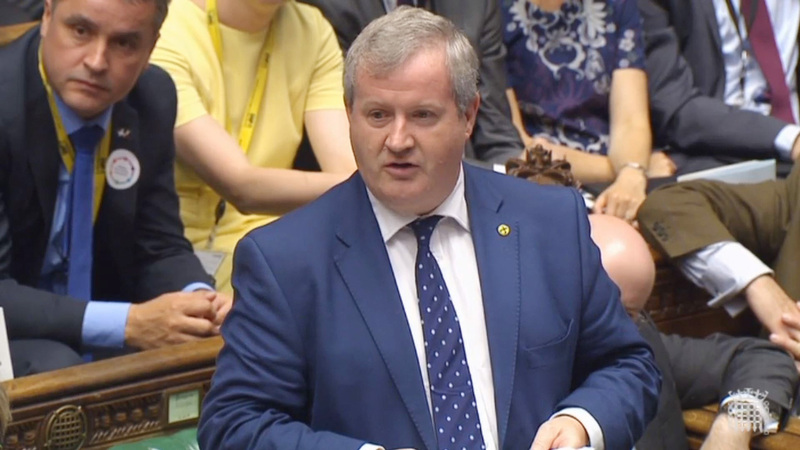 A TORY MP has been criticised for heckling the SNP’s Westminster leader Ian Blackford with a shout of ‘go back to Skye’. Nicholas Soames, MP for Mid Sussex, made the remark as Mr Blackford rose to speak in an emergency debate in Parliament this afternoon. 👇 This actually just happened. He added: “There’s the message to the people of Scotland from the Conservative benches. Mr Blackford represents Ross, Skye and Lochaber. Sir Nicholas has previously had to apologise for heckling an SNP MP. In January 2017, he made a ‘woof’ noise at Tasmina Ahmed-Sheikh. He said: “I thought that in her question to the Foreign Secretary she snapped at him a bit at the end, so I offered her a friendly canine salute in return. In today’s debate, Mr Blackford labelled Jeremy Corbyn “the midwife of Brexit” for failing to call a no confidence vote in the Government. Mr Blackford said Labour ducked the issue with its “embarrassing stunt” of calling for a confidence vote in the Prime Minister during an emergency debate on the EU Withdrawal Agreement. Focusing on the Prime Minister rather than the Government means there is no statutory requirement for the issue to be debated and voted on. Only the leader of the official opposition has the right to demand a vote of no confidence in the Government be taken, potentially toppling the Tories from power. As a result, Mr Blackford said: “The leader of the opposition has become the midwife for Brexit. “The leader of the opposition is letting the Government off the hook. “He has it in his gift to bring a forward a no confidence motion that will test the will of the House and, crucially, will allow his party to move onto the issue of a People’s Vote. Mr Blackford added he was “pleading” with Labour to work cross-party with the SNP, Liberal Democrats, Plaid Cymru and the Greens to bring forward the vote. “On the basis of the risks we all face we have a responsibility to come together, we have to unite, because it’s in the interests of all our nations to do that,” he said. “Based on the very, very real risk there will be no deal as a consequence of the stupidity of what has come from the Government, we now have that responsibility. As a member of the Privy Council, Mr Blackford said he had seen details of the impact of a no deal Brexit but was sworn to secrecy and urged the Government to publish the “sobering” details. Meanwhile, SNP MP Angus Brendan MacNeil (Na h-Eileanan an Iar) asked whether he could table a motion of no confidence in Labour. Raising a point of order on Labour’s confidence motion, he asked: “Is it possible for a backbench MP to table a motion of no confidence in Her Majesty’s Opposition, given the mess they have made of tabling the motion of no confidence, confusing even their own backbenchers? Speaker John Bercow responded by saying he was “not aware of any precedent for what he cheekily suggests”. Tory former minister Anna Soubry, raising another point of order on the issue, asked the Speaker whether he could help Labour “conduct themselves as a proper, functioning opposition” on the same issue. In a separate point of order, Labour was accused of “playing games” with its motion of no confidence in the Prime Minister by Tory former minister Sir Edward Leigh. He said: “The Fixed Term Parliament Act is absolutely clear that if Her Majesty’s Opposition table a motion of no confidence in the Government an immediate debate has to be held and, indeed, if the Opposition had tabled such a motion last night, we would now be discussing a motion of no confidence in the Government. Mr Bercow said: “I should make it clear that there is a strong convention the Government provides time at an early opportunity for a no confidence motion in Her Majesty’s Government if tabled by the official Opposition.